The National Aeronautics and Space Administration (NASA) and Ad Astra Rocket Company of Webster, Texas have entered into a Space Act Agreement that could lead to conducting a space flight test of the Variable Specific Impulse Magnetoplasma Rocket (VASIMRâ„¢) engine on the International Space Station (ISS). The VASIMRâ„¢ engine is a new plasmaâ€“based space propulsion technology, initially studied by NASA and currently under commercial development by Ad Astra. The agreement was fully executed on December 8, 2008. It was signed on behalf of NASA by its Associate Administrator for Space Operations, William H. Gerstenmaier and on behalf of Ad Astra Rocket Company by its President and Chief Executive Officer, Dr. Franklin R. Chang DÃ­az. It is the third agreement entered into by the parties since June, 2005 relating to the VASIMRâ„¢ technology development. The agreement is structured in a series of â€œgates,â€ designed to allow the parties to assess the requirements on an incremental basis while proceeding to flight. Upon the successful achievement of the milestones set forth in the agreement, NASA and Ad Astra envision that VASIMRâ„¢ will be launched to the ISS where the rocket can be tested, for the first time, in its intended environment: the vacuum of outer space. The NASA Authorization Act of 2005, Section 507 (P.L. 109-155) designates the US portion of the ISS a National Laboratory. While smaller projects have already been initiated for installation at interior locations of the ISS, the Ad Astra project will serve as a â€œpathfinderâ€ by demonstrating a new class of larger, more complex externally-installed science and technology payloads, encouraging others to pursue similar projects and facilitating their efforts with a model for implementation. 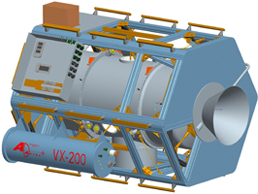 The primary technical objective of the project is to operate the VASIMRâ„¢ VF-200 engine at power levels up to 200 kW. Engine operation will be restricted to pulses of up to 10 minutes at this power level. Energy for these high-power operations will be provided by a battery system trickle-charged by the ISS power system. These tests will mark the first time that a high-power, steady-state electric thruster will be used as part of a manned spacecraft. Ad Astra is developing the VF-200 payload entirely with funds from private investors. The partnership described in this agreement represents a collaboration between NASA and a private entity never before attempted. Ad Astra is excited to partner with NASA on the goals set forth in this innovative partnership which, when successfully accomplished, will dramatically demonstrate the use, versatility and value of the ISS as a national asset.